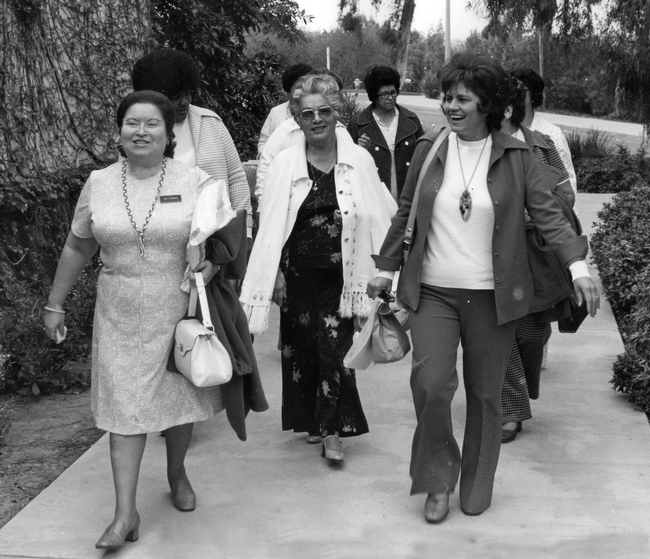 For 50 years, UC Cooperative Extension EFNEP educators have taught Californians in their communities, at community centers, schools, Head Start preschools, churches and, sometimes, in their own homes how to lead a healthy life. The Expanded Food and Nutrition Education Program (EFNEP) is an essential resource in the fight against poverty, malnutrition and obesity. It was implemented to teach healthy eating habits to the most vulnerable in the country: children, and their adult caregivers, such as single mothers and fathers, immigrants, unemployed, and elderly grandparents. EFNEP helps people who, in the ups and downs of life, face a time without enough money for food. EFNEP educators Inez Cisneros, Betty Miles, Emma Casas, Bertha Zermeno and Celia Guitierrez. Date unknown. One day, just over two decades ago, Peru native Nelly Camacho, an EFNEP nutrition educator, met a young immigrant who was looking for a food bank. In the City of Hayward in east Alameda County, the immigrant went to an EFNEP nutrition workshop where she was welcomed and invited to participate. Hesitating, she refused at first, claiming that she could not learn because she was illiterate. "You do not have to know how to read and write, you can look and listen, and you'll learn to save money on food purchases," Camacho said. The immigrant not only learned about nutrition, but she also felt proud of herself. 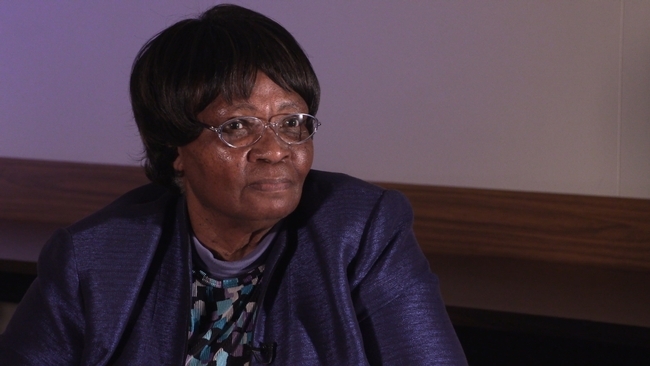 “It's the first time, in my whole life, that I have received a certificate,” she recalled the woman saying. With the EFNEP workshops, families have learned to plan nutritious meals, increase physical activity, save money when buying food, practice safe handling of food, and prevent obesity with healthy lifestyles. 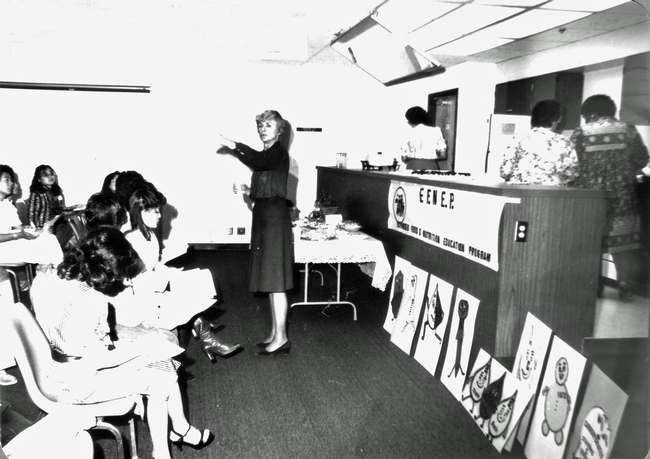 EFNEP now celebrates 50 years of service, and nutrition educators who teach classes to the community in schools, churches and community centers recollect stories that touch the heart. There are women, men and children who have learned to lead a healthy life because of EFNEP. Such as the case of a man in San Joaquin County who, on the verge of having heart surgery, found in healthy eating and exercise his best allies to elude the scalpel. And the child in a primary school in Contra Costa County, who after attending the nutrition workshop, remembered to put into practice what he learned. As soon as he ran into his nutrition instructor eating his vegetables, he said to himself: "Oh, I do not have any fruit or vegetables!" and ran to the salad bar. The movement to teach healthy lifestyles is part of a major national effort whose seeds were planted in the late 1960s. A professional historian, Hayden-Smith points out that EFNEP was conceived as part of President Lyndon Johnson's “Great Society” movement, an ambitious set of domestic programs which sought to eliminate poverty, increase racial equity, and improve the environment. Although the EFNEP program is directed by the USDA, it sought not only to reach rural families, but also families who lived in the nation's growing urban areas. "Based on the success of the pilot programs, EFNEP was funded permanently in 1969, through Smith-Lever funds included in the nation's Farm Bill," Hayden-Smith said. So, in the middle of the Apollo 11 era and when man first landed on the moon, EFNEP was born. It is delivered in the Golden State by UC Cooperative Extension. Alameda was one of the first counties where the EFNEP program began, and for its implementation, it recruited nutrition educators, most of whom were homemakers who received training from the UCCE experts. "They originally thought that advisors could do that program, and then they realized that they really needed community people, who know the community, who can relate to the people in the community and could speak their language and were aware of certain cultural sensitivities, and that is when they started actually hiring what they called in those days nutrition aides. They designated at that time that these educators should be from the community, familiar with the community and could relate to the community, and also be role models for other people in the community," said Mary Blackburn, a nutrition, family and consumer sciences advisor. 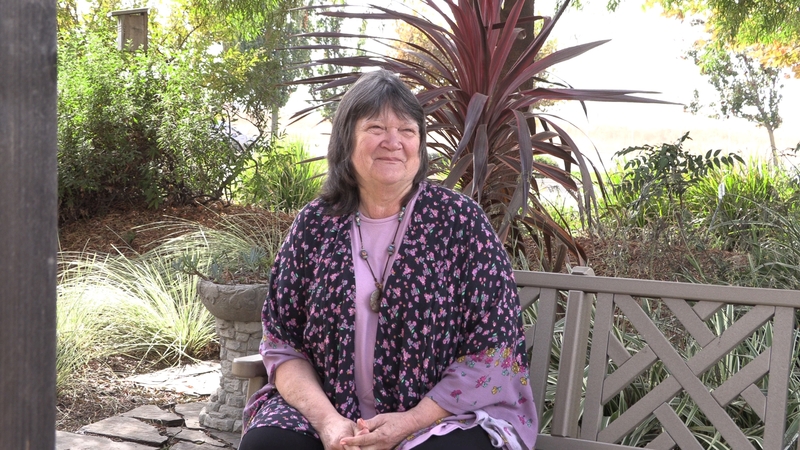 UCCE nutrition expert Mary Blackburn. EFNEP is currently considered one of the most successful preventative health programs. Research indicates that for every dollar invested in the nutrition program, $8.34 is saved in health care costs. "As an EFNEP educator, I worked with people who were in a drug rehabilitation program. One day between the fifth and sixth classes, a man approached me and said, 'You know I'm thrilled that you came to this class; I had heart problems, blocked arteries, and I had been told that I would need surgery, but the doctors said that if I continue with these changes I might not need the operation," said Anna Martin, a San Joaquin County nutrition, family and consumer sciences advisor who started as an EFNEP educator 30 years ago. "I do not know what happened to that man, but the important thing is that he learned that his health depended on the changes we talked about in class." Anna Martin, UC nutrition expert based in San Joaquin County. When EFNEP started there were no communication tools like those of today. There were no computers in homes, no cell phones in the pockets. Educators started knocking on doors in their neighborhoods, something they still do today. "The first challenge was to get to know the community and build trust," Martin said. "Developing that trust means you need to go out and meet the directors of the programs. You need to work at health fairs. You need to get your face, your name and who you are out in the community. And then, when you give classes, you must make sure that you are always doing it consistently, giving the participants a certificate at the end and later checking to see how they are doing." EFNEP continues to be relevant to the audiences it serves, and it continues to be a community program taught by educators who live in the communities where they work. "I live near the areas where I taught,” said Adán Osoria, an EFNEP educator in Contra Costa County. “You can see me in stores, when I'm eating. They know that I am a real person in the community, and I have similar experiences with which they can relate,"
Osoria is bilingual, a recent college graduate and he is taking the nutrition message to elementary and high school students full of energy. It's not easy, but he manages. "(The children) are enthusiastic about what they are learning, they talk with their parents about what they have learned and give out the brochures I give them. And in public places, they ask me, ‘Oh, are you the nutrition educator? My son always talks about this and what he likes,'” Osoria said. "One of the biggest challenges I had when I started was to review all the curricula we had to offer. There are more than 20 lessons only for elementary school. So, at the beginning, I felt it was a lot, but the more I studied, the more I learned them and now I know them like the back of my hand," Osoria said. In the promotion of healthy eating, battles have to be fought on different fronts, and for that, a team of UCCE experts is conducting surveys and evaluating the factors that prevent people from eating healthy. "One of the challenges I face when I work with students is that I am essentially talking about healthy foods, but as soon as the bell rings and they leave school, the communities in which we teach are surrounded by fast food. Whether it's a liquor store or convenience store where the healthy foods we talk about in the nutrition workshops are not an option," said Eli Figueroa, a nutrition educator in Contra Costa County.